The article on which the church stands or falls – you best have this one down pat! There are two sections to this work: Part 1 is a History of the Doctrine of Justification; Part 2 is the exposition of the doctrine itself. 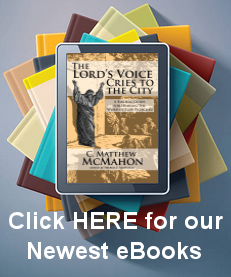 In Part 1 Buchanan covers the doctrine through the OT, the Apostolic Age, the Scholastic Divines, the Reformation, in the Church of England and within the Protestant ranks. Part 2 covers the scriptural meaning of the term, its relation to the law and justice of God, its relation to the Mediatorial work of Christ, its relation to grace and works, and more. This was the textbook we used in seminary under the tutelage of RC Sproul. It is an extremely helpful book, not too difficult to follow. Buchanan does not set out to teach us something new, but rather to state what has already been said and systematize it in a responsible fashion. However, the doctrine of Justification is often set in the bigger context of systematic theology and systematic theology books. Here Buchanan writes an entire book on the doctrine itself which is refreshing. It is not popular reading, or something you would read while running on the treadmill at the gym. Rather, it would be most helpful during morning devotions or family worship; or even used in a small group setting. When I peruse my library I still look to this book as one of the most prominent, definitive works on the subject.